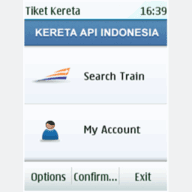 "Tiket Kereta" is "Kereta Api" Online Mobile Reservation Application for Nokia Asha & Asha Touch. Now available at Nokia Store for free. Search the schedule & price, book your ticket directly from this application. This application require Tiket.com Account to make reservation.
" Tiket Kereta is an application that allows you to buy train tickets via your mobile phone. Payment methods accepted are bank transfer to Mandiri and BCA and payment through klikBCA. This application is free and intended for people living in Indonesia "